The ice sheets prevent the mice from leaving the Valley, so very quickly all the problems that come with a real population explosion in an enclosed area develop. Logimus worries that the mice should be encouraged to practice some breeding restraint, but Adamus pooh-poohs this. Did the Men practice any kind of sexual restraint? No, according to the lurid tabloid coverage in the left-behind newspapers, they did not! So the mice continue to have lots of babies, and soon the Valley becomes overcrowded. Logimus urges birth control more strongly, but Adamus is sure that this is not the solution. The newspapers of Men have dwelled upon the health risks to smoking cigarettes, at the same time that they were filled with advertising for cigarettes. Obviously the approved way to lower the mouse population is to encourage all mice to smoke cigarettes! And so all the mice, including the babies, become heavy smokers. Any drop in the population is miniscule compared to the rate at which new mice are being born. Besides, the natural lifespan of mice is too short for them to develop cancer or other smoking-caused diseases. Soon the mice are treading on each others’ toes. Now can the Board recommend that the mice practice sexual restraint? Logimus asks. The others looked at him intently and respectfully, although in their tiny hearts they doubted. They had heard too many solutions by this stage. ‘True, true,’ mumbled the Board members politely. 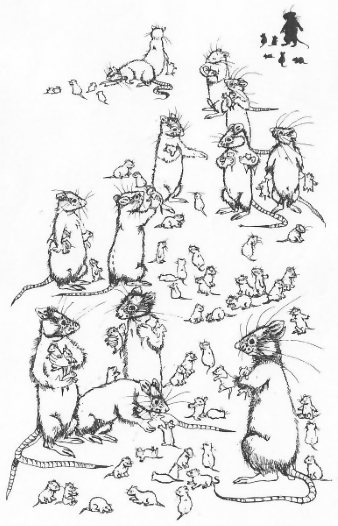 ‘Gentlemice,’ Adaus paused and looked each mouse steadily in the eye. This took him quite a while and Logimus had to stifle a yawn as he waited for the next word. ‘Wrong?’ said Logimus at last, politely. ‘But surely it was simply to carry people about?’ said Logimus. At this point he stood up and took hold of the New York Times, which had been reduced in size by a special process the mice had developed. ‘Did it really?’ said Logimus. ‘Did they do it on purpose, do you think?’ asked Logimus who, as usual, was beginning to look puzzled. And so motor cars are manufactured for each mouse, including the children, and they are encouraged to drive everywhere they want to go, even the shortest distances, at top speed, without anything approximating driving lessons. And the slaughter is indeed great, but it is hardly a drop in the bucket for the millions of mice who are giving birth constantly. Wars killed people. Let’s have wars! Obviously God wants lots of warfare, the bloodier the better. But still the mice have babies and more babies. Finally Adamus unveils his Master Plan. And although it is the climax of the novella and supposed to be a Big Surprise to the reader, it is so shockingly witty that virtually every reviewer could not resist quoting the two final lines. I am made of sterner stuff. If you want to know how Play Little Victims ends, read the book. This first edition is expensive today, but there was a 1984 British paperback that is available used cheaply. Confusingly, Amazon.co.uk lists this as published by Pergamon Press (in August 1978), while Amazon.com says it is published by Maxwell Macmillan (June 1978). Presumably not the U.S. branch… they share an ISBN, though given how those work for English-language works it's impossible to tell whether it is from the U.S. or the UK. Of course, anyone can write descriptions. There's a review mentioning a paperback from Futura (unreferenced Wikipedia article) with an entirely different cover; I believe that was also a UK publisher. The review says 1978, Amazon says 1984. I suspect that Amazon.com is wrong. 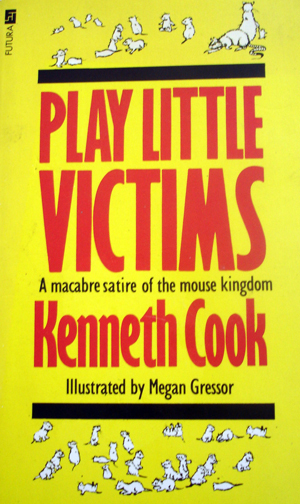 Wikipedia (which we know is never wrong) says that, "Kenneth Cook (1929–1987) was a prolific Australian journalist, film director, screenwriter, TV personality and novelist best known for his works Wake in Fright, which is still in print five decades after its first publication, and the humorous Killer Koala trilogy." It seems illogical that such an Australian author would have his novella first published in either the U.S. or Great Britain. 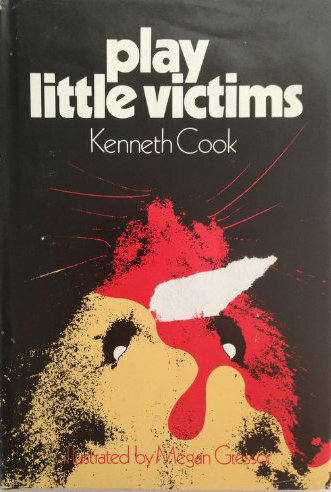 In any case, "Play Little Victims" is well worth reading, if you can find a copy. The Futura edition is a British paperback reprint, now also out of print. I have not been able to obtain Cook's "humorous Killer Koala trilogy". Is it anthropomorphic? Amazon has the Killer Koala. Amazon mentions he is author of "21 books". this list has less but seems like the most reliable. Sounds interesting. Since you mentioned them I went to look up the last two lines in other reviews. They had no context though. :/ If I see it lying around, I'll try get a copy. Higgs Raccoon, who is no longer a Flayrah contributor, has sent me an e-mail about Kenneth Cook’s “humorous Killer Koala trilogy”. They are “The Killer Koala; Humourous Australian Bush Stories” (Sydney, Tortoiseshell Press, 1986); “Wombat Revenge” (ibid., 1986); and “Frill-Necked Frenzy” (ibid., 1987). The last is described by Amazon.com as, “A selection of hilarious true stories featuring the wild animals and humans of Australia's Outback.” So no, they don’t sound Furry. They are also out-of-print and fairly expensive used. Why is he no longer contributing? Who knows? These comments are open if he wishes to explain. By the way; thanks, Higgs, for the Killer Koala trilogy information. Knowing humanity as I do, some of the articles he contributed probably got him no shortages of angry direct messages as the result of those articles. You know, as if he was the reason the bad things happened in the first place. People are stupid like that, and furries are indeed cursed with those same impulses that defy cognition. Though I could be wrong... that'd be the least surprising thing. I dimly remember that a long time ago - a long time before I had my stroke in 2005 - there was a news report about some Australian government official who said in an interview that koalas do not make good pets. They are high-maintenance because they only eat a limited kind of eucalyptus leaves (not any eucalyptus leaves), they sleep almost all the time, they do not show affection, they cannot be housebroken, and they are designed by nature to have very sharp claws so they can climb trees, so when they are picked up by people, they instinctually dig into the people with their sharp claws. The official got a lot of hate mail for saying such bad things about the darling koalas. Since so many people say in their reviews that Cook's Killer Koala books are the closest they expect to ever get to Australia, here are my three Australian animal stories. In 1995 I was invited to Sydney (all expenses paid) to read a paper on the "Simba vs. Kimba" "coincidence" at an international animation conference. One day I was walking through a Sydney public park when a sacred ibis flew down onto a trash barrel right in front of me, overturned it, walked inside and kicked all the trash out (making a mess), then started picking through the trash for edible garbage. Sacred ibises are not thought of as Australian birds, but they migrate there from Egypt every year. On that same visit, I went to the Blue Mountains near Sydney. The Blue Mountains are full of wild cockatoos. The birds were as fascinated by the human tourists as the tourists were in them, and would come right into the tourist center to study them at close range. But aside from that, the cockatoos were always fighting with each other, over mates and the best nesting places and anything else. The endless squawking was deafening. In 1999 the World Science Fiction Convention was in Melbourne; Aussiecon III. There were several American Furry fans among the attendees; Kris Kreutzman, Jim Groat, and others. Just after the convention, about a half-dozen of us went to a big wild animal preserve about 45 miles (or was it kilometres?) outside of Melbourne. We got into a big animal enclosure with several kangaroos roaming loose. The kangaroos gradually surrounded us. Suddenly one them grabbed the map of the preserve out of David Bliss' hand and began to eat it. It took three or four of us to get what was left of the map out of the kangaroo's mouth, and by then one of the other kangaroos had started to nibble on someone's pants. Apparently kangaroos are like goats; they will eat everything. Oh, I forgot one. On that 1995 visit to Sydney, one day I visited Dr. Alan Cholodenko, who had organized the international conference, at his offices at the University of Sydney. We were leaving together at dusk when A GIANT FRUIT BAT dived down at me, and swooped up just inches over my head. Dr. Cholodenko said casually, "Don't mind the fruit bats. They live in the big fig trees all over campus, and come out at dusk. They're gliders more than flyers, and they drop out of the treetops to get to gliding speed before they fly off." The fruit bats are not really as large as they seem when they are diving right at you. More people need to realize that just because an animal looks cute and cuddly doesn't mean it makes a good pet. Big cat sanctuaries are filled to overflowing with the aftermath of failure to understand that. As for koalas, another one I've heard is 'Anyone who thinks a koala would make a good pet has obviously never smelled one'. For whatever odd reason the Cleveland Public library had a copy of this, which is where I read it. Some of the illustrations are both macabre and hilarious (mice having abortions while smoking cigarettes and drinking). Too bad it's not available in wider release. I am surprised that any U.S. library has a copy of this since I don't think there was ever a U.S. edition. I had to mail-order it from a rare-book dealer. (My copy went to the University of California at Riverside Library after my stroke in 2005.) Yes, it is weird; sort-of slit-your-wrists funny. Say, I wonder how much it would cost an American Furry publisher like FurPlanet, Rabbit Valley, or Sofawolf to license a U.S. edition? If any of them want to break out of the Furry ghetto with sales to libraries throughout America, this could be the right book.